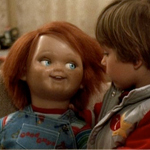 We all know Chucky, the vulgar, red-haired, Jack-Nicholson-sounding killer doll. He’s almost as famous as Freddy or Jason, characters that you don’t have to watch horror movies to be aware of. 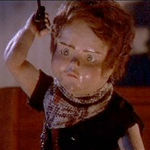 But when I first saw CHILD’S PLAY in 1988 I honestly didn’t know it was gonna be a killer doll movie. The poster/newspaper ad only showed Chucky’s evil eyes hovering in the sky over little Andy’s babysitter plummeting from the window of their Chicago apartment. A TV ad showed a quick glimpse of him attacking, but I remember thinking of what I was looking at as some kind of crazy witch lady. 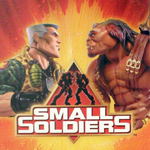 Maybe a killer dwarf? An exciting moment in my recent trip to Vegas was seeing a portrait of Chucky and his bride Tiffany posted in the tiny lobby of an Elvis chapel along with Rob and Sheri Moon Zombie, Jon Bon Jovi and somebody he married, Richard Belzer just by himself. There were plenty of horror movies in 1988, but I doubt they’d hang pictures of the killers from BLACK ROSES or HIDE AND GO SHRIEK or even MANIAC COP in there (although that would’ve been a thrill too). Chucky has lasted. 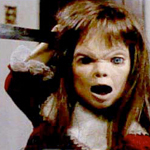 I always wanted to see this movie because I thought it was funny that they thought it was worth making a rip-off of CHILD’S PLAY but the killer doll is a girl. As if the very femaleness of the killer doll would change everything, because of the daily challenges a woman faces that are different from a man, or whatever. Well, I really didn’t need to see this. I don’t necessarily feel like I’ve gained anything.